Special Offer. Buy 6 Bottles for £32.50 each. Save £15.00 !! Single Bottle Price - £35.00. A crystal clear, pale golden-yellow hue. On the nose intense, elegant and warm, first and foremost a vehicle for mellow, potent yet very fresh floral notes, such as honeysuckle, wisteria, white jasmine and vine blossom, rapidly giving way to mature, fruity aromas, from delicately perfumed melt-in-the-mouth garden pears to the sweet, more identifiable perfumes of exotic fruits, such as pineapple, guava and mango. In the mouth generous invigorating and jubilant, a taste which is both fresh and delicate, following on from the initial sensation of crispness and a well-established vitality to suggest the richness of a blend where floral aromas have all but disappeared, replaced by the sweet and comforting flavours of ripe, fleshy fruits, such as bush peaches, nectarines and greengages. A mouthful deploys great volume, a profound density and vinosity, which are characteristics of this type of champagne, whilst the blend remains discrete. An earthy taste with hints of minerals released from sun-baked stones can be detected, revealing the subtle fragrance of spices, such as cinnamon, cardamom and green pepper. Finish is smooth, delicate, irresistible, where the deliciously sensual flavours of candied fruit, cinnamon cake and liquorice can clearly be identified. chicken, farm-reared guinea fowl, young duck from Nantes or Rouen reared in their own habitat or hay and cabbage-fed rabbit, which may be braised, roasted or casseroled. Champagne Gosset is the oldest wine house in Champagne established in Ay in 1584 and is owned by the Cointreau family. The Cointreaus also own Gosset’s sister company, Cognac Frapin, and Jean Pierre is currently C.E.O of both companies. They bought Gosset in 1993 when Albert Gosset of the original Gosset family died. The Cointreaus hold strong the belief that Gosset is a family run business and maintain the hands on approach that was started by the original Gosset family. Situated in the tiny Grand Cru village of Aÿ, 5 kilometres north of Epernay, Gosset has some rather famous neighbours, including Bollinger. However, production is much below that of the larger houses and would struggle to reach the number of bottles produced by Krug in a year. Yearly production has now reached almost 1.3 million bottles. All Gosset champagnes are ‘recently disgorged’ and the house does not undertake malolactic fermentation. This preserves acidity which in turn keeps the wine fresh for much longer. Bottles are removed from one part of the cellar to another every six months, and given a vigorous shake in the process. This reinvigorates any live yeast and is only carried out by a few houses. 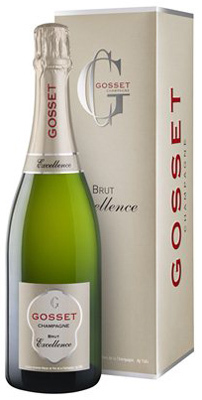 The Gosset style is very creamy, dry but not acidic, full, biscuity and yeasty. All the cuvees have good bottle age. The champagnes are excellent by themselves or with food.